cornflour recipes. cornstarch recipes. Indian cornflour recipes. Corn flour is a pale white, starchy powder which is milled from maize kernel. It does not have any particular taste. It is gluten-free and commonly used as a thickening and binding agent. Most Indo-Chinese soups are made using pungent ingredients like ginger, garlic, spring-onions, a myriad of vegetables and sauces that are simmered in vegetable stock. It is then thickened using a cornflour slurry. The slurry is made by diluting cornstarch in cold water and adding to the hot pot. Manchow Soup, Chinese Veg Soup, Hot and Sour Soup are not only aromatic but also, has tongue-tickling flavours. Relish it slowly, enjoying the variety of veggies that clamber for your attention in every spoonful of this soups. With just a handful of ingredients, you can quickly whip up delights like Mushroom Soup, Broccoli and Walnut Soup and Spinach Soup with Garlic which is healthy and heart-warming. Enjoy these comforting soup piping hot on days you feel low or any cold winter’s day for that matter. Deep-fried or shallow fried cutlets make for an amazing evening snack. Serve them with dips and chutneys as a party starter or as your kid’s lunch box snack. While the addition of rice flour or coating with breadcrumbs provides a crispy texture, corn flour binds together all the ingredients. This ensures that the cutlet won’t disintegrate on cooking. Recipes like Noodle Vegetable Cutlets and Vegetable Maggi Cutlets will surely be a hit among the kids. An addition of cheese to the mixture enhances the flavor of the cutlet. Do try making the Cheesy Noodle Vegetable Cutlet and surprise everyone around. Koftas are small, round balls that are deep-fried and relished as it is or simmered in a gravy to make sumptuous curries. They can be made using an array of ingredients like boiled potatoes, cheese, paneer, mawa or mixed veggies. Corn flour is a major ingredient used to combine together all these ingredients and give a smooth texture. If you are looking for healthy variants then you can even steam them instead of frying. Rajma Kebab, Hare Chane Ke Kebab, Hara Bhara Koftas are some other Indian appetizers that are loved by everyone. With a plethora of spices and melt-in-the-mouth texture , they vanish from the plate in no time. Trust me! Malai Kofta with naan is one of my personal favorite dishes. Succulent dumplings in a rich tomato gravy, cooked in butter and topped with cream is simply irresistible. Nawabi Kesar Koftas, Paneer Palak Koftas in Makhani Gravy or Saagwala Cheese Kofta makes a wholesome meal together with parathas and rice. Adding cornflour dissolved in water to boiling milk, reduces it quickly giving it a nice, luscious texture for ice-creams and kulfi. The creamy milk can be enhanced by adding different flavoring and coloring agents. The Basic Vanilla Ice-cream requires not more than 5 ingredients and can be added to numerous desserts as milk shakes, smoothies and sundaes too. Try your hands on other sinful recipes like Paan Ice-Cream, Mango Kulfi or Malai Kulfi and surprise your friends and family. Cornflour ( Cornstarch) : Pros. Cornflour is easy to digest because of the presence of insoluble fiber, thus benefits the gut. It’s gluten-free and can be consumed by those who cannot afford to stock wheat. Cons. 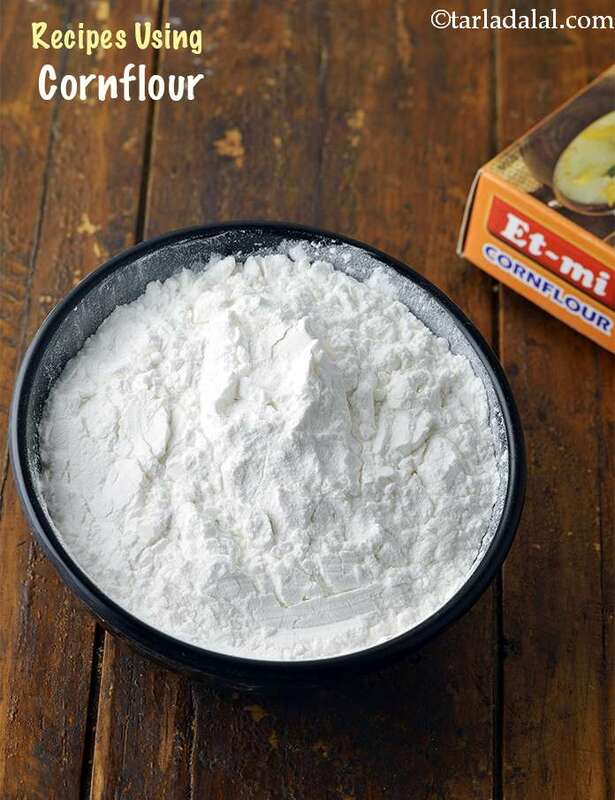 Cornflour is full of calories and carbs like refined sugar, thus a barrier to weight reduction. Those on weight loss diet must definitely not reach out for it. The high crabs makes it a No-No for a diabetic meal and restricted for heart patients. Read for more details is cornflour healthy? Hope you enjoyed our collection of 977 cornflour recipes ranging from starters to desserts. We are sure this multi-purpose ingredient will come very handy so, don’t forget to stock up your kitchen with it.